When we see the words Energy Star Dehumidifier or Energy Star Qualified Dehumidifier in a dehumidifier review what does it mean? The Energy Star partnership has many programs to save you money and to protect the environment from carbon emissions. One of these programs is to award the Energy Star Qualification to household appliances, including dehumidifiers. To qualify a product must meet strict energy efficiency guidelines. Products that are selected must be widely used, so that the energy savings are significant and must not sacrifice the features and performance expected by consumers so as to achieve greater energy efficiency. If an Energy Star qualified dehumidifier, or any other product, costs more than a non-qualified equivalent, the energy savings must be large enough to repay the difference in ticket price over a reasonable time. The energy efficiency of the product must be measurable through testing and must be achieved by use of technologies available to other manufacturers, that is to say not restricted by sole patent rights. Energy Star rates the energy efficiency of a dehumidifier by the volume of water (in litres) it can extract from the air for every kilowatt hour of energy used. This figure is called the "Energy Factor". The higher the Energy Factor the more energy efficient the appliance. Large capacity dehumidifiers are more energy efficient than smaller models so Energy Star use a sliding scale to rate units within bands of water removing power. The scale runs from 1.2 litres per kilowatt hour to 1.8 l/kwh. In order to qualify for the Energy Star award a 25 pint unit, for example, must extract at least 1.4 litres per kilowatt hour while a 70 pint model must achieve at least 1.8 l/kwh. The complete list of bands is shown in the table below. 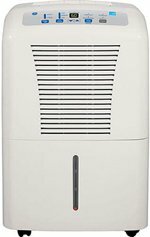 Energy Star publishes a complete list of qualifying dehumidifiers which is regularly updated. You may download a free copy by clicking on Energy Star list (opens in new window). The list is in PDF format which can be read in Adobe Reader. Adobe Reader is free to individual users from Adobe.com. If you do not have Adobe Reader on your computer simply follow this link to Adobe.com. In the box entitled "Download" click on "Adobe Reader" and follow the instructions on the screen which appears. Is an Energy Star Dehumidifier Always the Best Choice? If a dehumidifier is Energy Star Qualified and another model in the same band is not, the Energy Star unit is the best choice, all other things being equal. What other things might not be equal? An appliance may not be Energy Star qualified if it achieves high energy efficiency by using technology that is owned exclusively by the manufacturer. Such technology may make the unit more energy efficient than the qualified model but would exclude the non-qualified model from the qualification process. A dehumidifier may provide an unusual capability, extreme low temperature operation or low grain refrigerant capacity for example, which may be of greater importance to an individual user than energy efficiency. The appliance may have an unusual characteristic which makes it more suitable for a particular application, such as ignition protection for use on a boat as required by Federal Law for use in the engine compartment or bilges, that is more important than its energy efficiency. Other items could be added to this list but it is sufficient to say that an Energy Star Dehumidifier is not always the best choice and it is wise to take other factors into account when making that choice. For most users, who need a portable for their basement for example, it is safe enough to discard any model which is not Energy Star qualified when making your short list. As this page is about Energy Star it seems appropriate to leave the last word to them. "Use an ENERGY STAR qualified dehumidifier and save about $20 per year". This was the "tip of the day" on the Energy Star website the day this article was published, Tuesday March 29 2011.